Amid all of Venezuela's problems, the country is running out of time and money. Venezuela only has $10 billion in reserves -- the cash that's intended to keep an economy stable and weather tough times. What's worse: most of those reserves aren't in hard cash. About $7 billion is in gold bars, which doesn't make it easy to make payments. And Venezuela has a lot of bills to pay soon. It owes $6 billion in debt payments for the rest of this year. There's also no sign that the country's lone source of revenue -- oil exports -- will be able to pay down those debts. At the end of the day, Venezuela is running the risk of defaulting on its debt this year, meaning it wouldn't be able to get more loans to pay for basics like food and medicine, which are in scarce supply. In 2011, Venezuela had $30 billion in the bank. As recently as 2015, it had $20 billion. 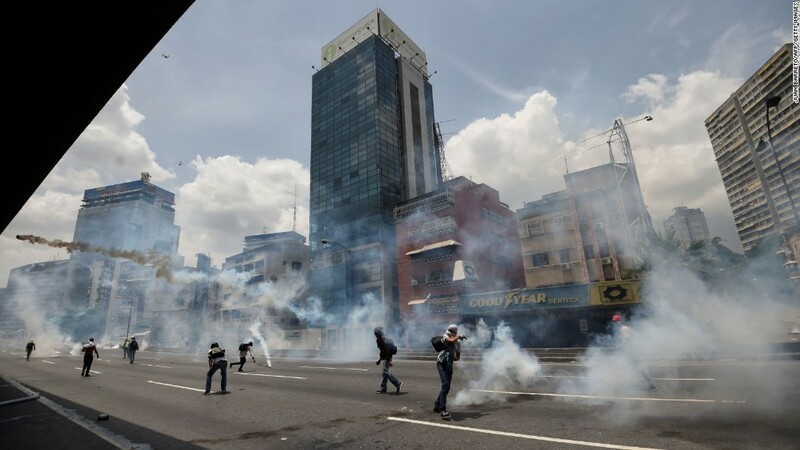 The worsening financial picture underscores Venezuela's problems. Violent, anti-government protests killed three people Wednesday, and more protests are scheduled for the weekend. Armed forces met protesters with tear gas and shots. Also on Wednesday, General Motors (GM) said Venezuelan authorities seized its assembly plant. Authorities later denied it was seized, saying it's embargoed until a long-running court case is resolved, but that distinction didn't matter to GM: it shut down operations due to the government intervention. The IMF predicted on Tuesday that inflation in Venezuela would skyrocket 720% while unemployment would shoot up over 25%. This year will likely mark the fourth straight year of recession -- entirely under socialist president Nicolas Maduro, who blames the U.S. and political opponents for the country's problems. But many are questioning the priorities of the government. Filings showed Venezuela -- unable to pay for imports of food for its millions of starving citizens -- donated $500,000 to President Trump's inauguration committee. To make debt payments last year, the Venezuelan government started shipping some of its gold to Switzerland to either serve as collateral for a loan or a cash-for-gold exchange. So far, Venezuela has paid its creditors instead of paying for basic imports of food and medicine for its struggling citizens.